AFC Fylde have signed experienced midfielder Andy Bond from Crawley Town. 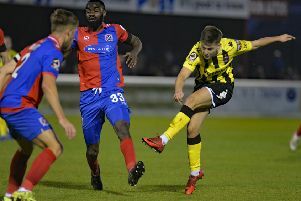 Bond will team up with fellow new boys Steve Williams and Brendon Daniels, who have joined from Barrow and Harrogate Town respectively, as the Coasters strengthen their squad for the coming National League North season. The former Chorley man, who started his career with Crewe Alexandra, has spent much of his career in league football, including making over 100 appearances in League One during a four-year stay with Colchester United. However, the 30-year-old admitted the chance to join the Coasters was just too good to turn down. “The assistant manager here Colin Woodthorpe knows one of my good mates and he had mentioned it when I was at Chorley. I knew there was some interest then but I moved back into the league with Crawley in early February. “The season finished so I came home to Wigan and then got a call from Dave Challinor and here I am. “I spoke to the gaffer and to Colin, saw the project and the ambition of getting up into the league and it was all very positive. Although more accustomed at plying his trade higher up the football pyramid, Bond admits Fylde were the perfect fit. “Obviously everyone wants to play league football but from the first visit I paid here I was sold on the idea. You just have to come here to the new stadium and look around to know this club is going in the right direction. “I spoke to a few other clubs but it doesn’t mean anything until you put pen to paper. When this opportunity came about it just ticked all the boxes. “I’ve played against Fylde in the past and I knew they wanted to play football. Not many teams play football at this level so that was another big factor. “The reason I am here is to get into the league. I know what’s planned for the future and that’s the main reason I have signed here. Talking of his style of play, Bond said: “What can the fans expect from me? A bit of everything really. I like to chip in with a few goals, I like a tackle but first and foremost I just want to get on the ball and play football.